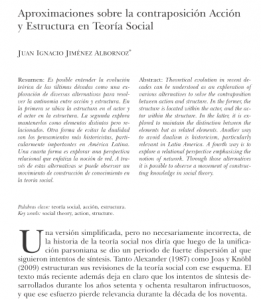 Being that the Mexican Journal of Sociology has seen fit to publish the article I wrote with the same title as this entry, will not be more -then – mention it on this blog, and proceed to give you the link. It is possible to understand the evolution theory of the last decades as an exploration of various alternatives to resolve the antinomy between action and structure. In the first place the structure in the actor and the actor in the structure. The second explores them as elements distinct but related. Another way to avoid the duality are the thoughts more historicist, particularly important in Latin America. A fourth way is to explore a perspective relational, which emphasizes the notion of network. Through these alternatives, one can observe a movement of knowledge-building in social theory.